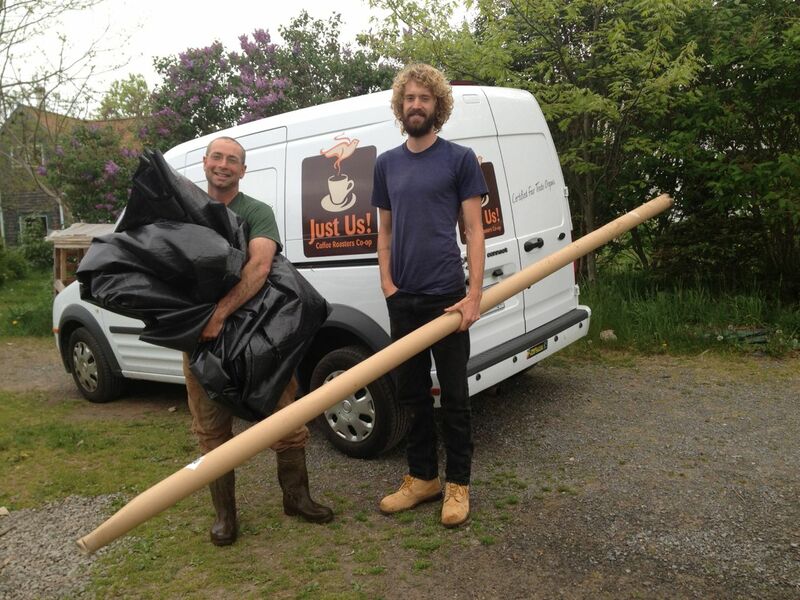 Marc, from Just Us Coffee’s demonstration garden in Grand Pré just dropped by to get some landscape fabric. He and Amy Lounder are setting up a comparison of weed control with and without landscape fabric in onions and strawberries. We can hardly wait to see the results. Amy has farmed here at Abundant Acres for the past two years and has observed our use of landscape fabric for weed control. It is useful for high-value, heat-loving crops like tomatoes, sweet potatoes, or melons, but it can also be used for crops like squash or brassicas. 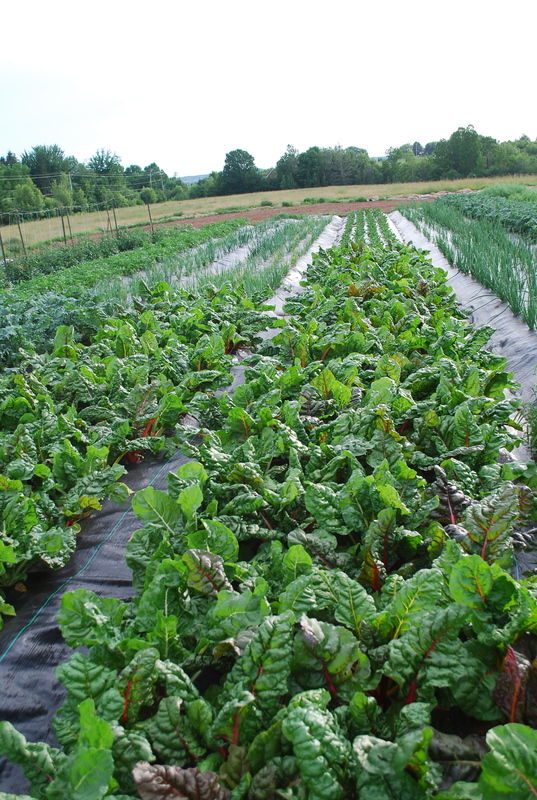 In the photo below, we were experimenting with planting many different crops into landscape fabric on raised beds. It reduces the need for tillage. Soil life (earthworms and ground beetles) really appreciate it. We also like it for season extension because the black fabric warms the soil in the spring and fall when ambient temperatures are lower. I also like it because it allows rain to penetrate to crop roots, but also prevents evaporation of precious moisture when it is dry. We apply landscape fabric over raised beds, cut holes, and plant transplants in the holes. The raised beds and black fabric help soil warm up and dry out a bit in spring. When there is too much rain (like last spring), it helped our garden produce crops early despite mucky conditions everywhere else. So it is helpful when it is too wet, too dry, or too cold. Landscape fabric lasts at least 15 years and if you take care of it, likely much longer. This entry was posted in efficiency, growing vegetables, season extension and tagged gardening, Just Us, landscape fabric. Bookmark the permalink. At the end of the season/crop, what do you do with it? Do the holes fray over time? How many beds does the one piece cover? The holes might fray over time. We make the holes with a round-shaped flame weeder so they are seared at the edges and that tends to keep them from fraying. We’ll see. We are only in our second season with holes in the landscape fabric. At the end of the season we could take up the fabric and store it, or leave it in place and plant something new in it the following season. Good questions! Just found this site and love it, great job. Landscape fabric is very expensive, any suggestions on type to get? Try emailing David (davidgreenberg71atgmail.com). He has been experimenting a lot with landscape fabric and is willing to order it for people who live in the Maritimes. Hi! I have small farm just outside Chicago IL. Having moved up to 7.5 acres last season, I’ve now decided I don’t want to have a ‘small farm’, I’d like to operate a ‘market garden’. Have been doing some research on using landscape fabric, and am currently experimenting with cucumbers, zucchini’s and summer squash. I was wondering what your perspective is now, 3 years after the post..? We have had good results using landscape fabric, but have bought a poly mulch layer and now use that with “bio 36O” degradable plastic mulch instead. I would say that for half an acre or less, the landscape fabric makes a lot of sense. I found that it is important to incorporate lots of compost before laying the fabric and to irrigate even though the fabric does conserve some moisture. If you have specific questions, I’d be happy to answer them.